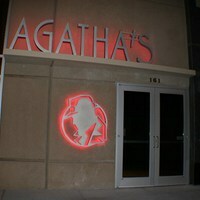 Agatha's is a comedy murder mystery dinner theater with audience participation. All shows are original comedy murder mystery plays that take place in the dining room between the courses of the meal. There is no stage; the actors move all around you so you can see and hear from all seats. Two professional actors carry the show, and the rest is up to the audience. Participation is encouraged but not required. Parking: Agatha's-A Taste of Mystery is attached to Level 3 of the parking garage off Andrew Young International Boulevard. Bring your parking stub for validation and a $5 parking rate. MARTA: Take the Red or Gold Line to the Peachtree Center Station. Exit onto Peachtree Street and head south towards Ellis Street. Turn left onto Ellis Street, then turn left on Peachtree Center Avenue NE.